Me and Alice were on a mission on Westbourne Park Road, London and took some quick outfit photos, really quickly, like in a 5 min timeframe haha, luckily Alice has proofed herself to be an amazing Street Style photographer! As some might already know she’s behind the London Street Style posts on the Miista blog which are really really good and inspiring but more about Alice and Miista later as our Mission was successfully completed 😉 Anyway I’m wearing Blue again! Kind of like this outfit where I mixed it with black, to roughen up the feathers so to speak! 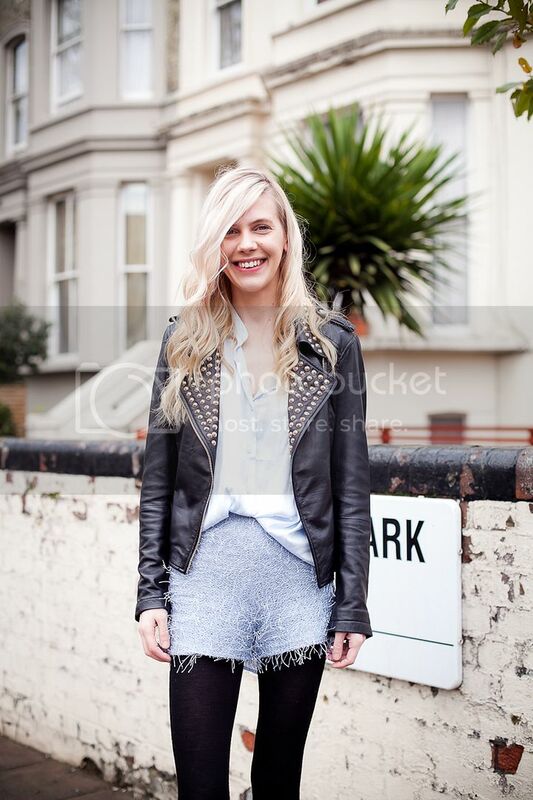 Wearing; Zara studded biker Jacket, H&M trend shirt, River Island shorts, Miista May Boots c/o Zalando. I was on this exact road this morning 🙂 Love that this outfit is totally cool and casual, but also has a bit of glamorous elegance to it. Great shorts, and great shirt-tucking skills! Wauw, wat een mooie foto’s! Verder ook leuke outfit meid! Love the boots! Cool look honey. The jacket is gorgeous . What a great collection of pieces! I love how you mixed the soft, girly, pastels with the rock n’ roll chic studded leather jacket – J’adore! You look really pretty with this look! heheh now, that I know, I can really tell this is Alice’s style of photography. You’re right, she’s great. Plus I really loved to see what Alice would do with the photography! I like it! Aahw those shorts are cute! wauw! it workt out perfectly! such fab short! love it!! Its my chief time to fill someone in on on this forum,merely wannat reap some friends here.if its not allowed to record on this panel,please strike out this thread.Nice to fit you! super cute pictures and really nice outfit!